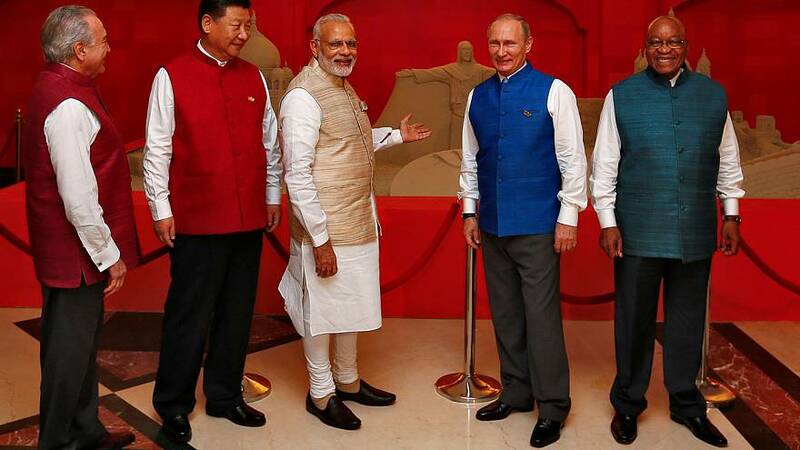 The leaders of the so-called Brics nations – Brazil, Russia, India, China and South Africa – are meeting in the Indian beach resort of Goa. The five countries make up nearly half the world’s population and about a quarter of its GDP, and re-balancing the global economy and giving the developing world more say in the G20 and IMF are expected to top the agenda. Host India is also pushing for strong action against terrorism, and earlier Prime Minister Narendra Modi praised Russian efforts to combat militancy. “Russia’s clear stand on the need to combat terrorism mirrors our own. We deeply appreciate Russia’s understanding and support of our actions to fight cross-border terrorism that threatens our entire region,’‘ Modi said. Stressing the need for zero tolerance against terrorists, Russia’s president also welcomed deeper cooperation with India in the military, space and energy sectors. “Our cooperation in the military sphere is rather successful. Russia is not only selling weapons and hardware to India but also, through our joint ventures, producing the most modern examples of the latest technology,” President Vladimir Putin said. Security surrounding the summit remains ultra tight. India has long accused Pakistan of letting militants operate out of its territory, something Islamabad denies. Modi is expected to raise the issue with China, a key economic ally of Pakistan.